Behind the visual identity and wayfinding for Strasbourg's cycle superhighways — Copenhagenize Design Co.
Like many other European cities, the Eurométropole of Strasbourg is developing a network of cycle superhighways, called vélostras, to connect all of the cities within its metropolitan area. In 2018, Copenhagenize Design Co. designed a logo, visual identity, and comprehensive wayfinding strategy for vélostras. In encouraging people to use bicycle infrastructure, designing a high quality network — for example, the security of the intersections, or the comfort of the surface — is always of the utmost importance. However, a set of cycle superhighways also requires a strong visual identity, so that it can be properly understood and used as a route for long-distance travel. Graphic elements, such as a coherent logo and set of pictograms for wayfinding, create a more attractive network, catch the attention of all residents, and ease long-distance trips that may veer outside of a bicycle user’s ordinary area of commute. The visual identity we designed for vélostras is based on 12 vibrant colours for the 12 total routes in the network, in which each route is assigned its own individual colour. 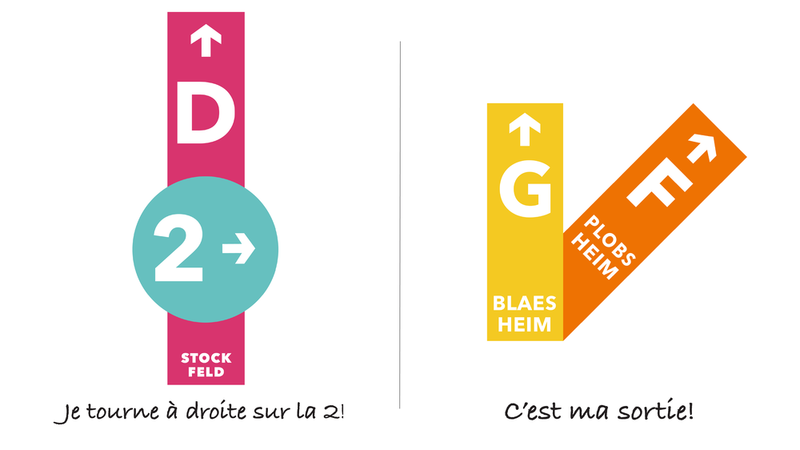 There are 10 radial routes connecting between the centre of Strasbourg and surrounding areas, while two circular routes allow bicycle users to easily switch from one radial axis to another. Through this approach, a regional context is given, simultaneously serving as a baseline for wayfinding. 12 colours, for 12 cycle routes. The 12 colours and routes led to the creation of the vélostras logo itself, as seen below. The logo provides the bicycle routes with a strong and recognisable identity and familiarises residents with the map of vélostras itself, as the logo’s shape resembles that of the bicycle network. The logo, and the map. The signs that will be placed along the vélostras routes each serve different purposes. 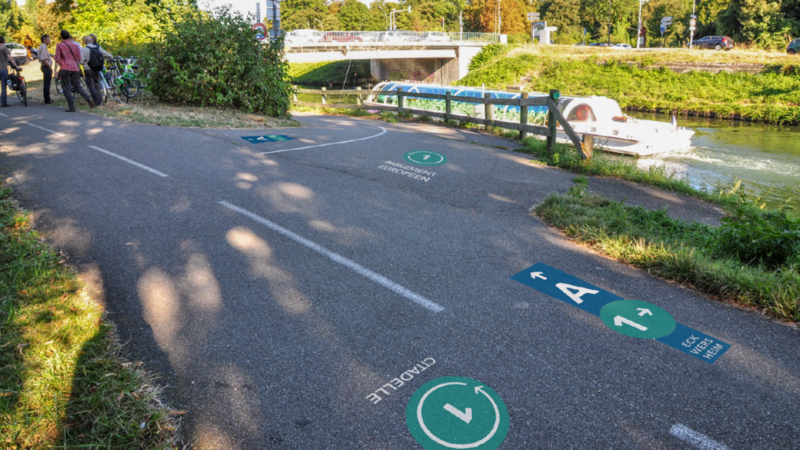 While classic sign posts will be deployed, customized according to the route and its colour, an additional form of wayfinding will be implemented in the form of painted stamps on the ground. Similar stamps are already being used in Copenhagen and Flanders, since they are ideally located in a bicycle user’s field of view. This wayfinding on the ground provides the basic information one would need to orient oneself along a route — namely, the number of the route, the destination, and a directional arrow. To differentiate between the circular routes and the radial axes, rectangles are used for showing the direction on radial routes, whereas circles are used on circular ones. 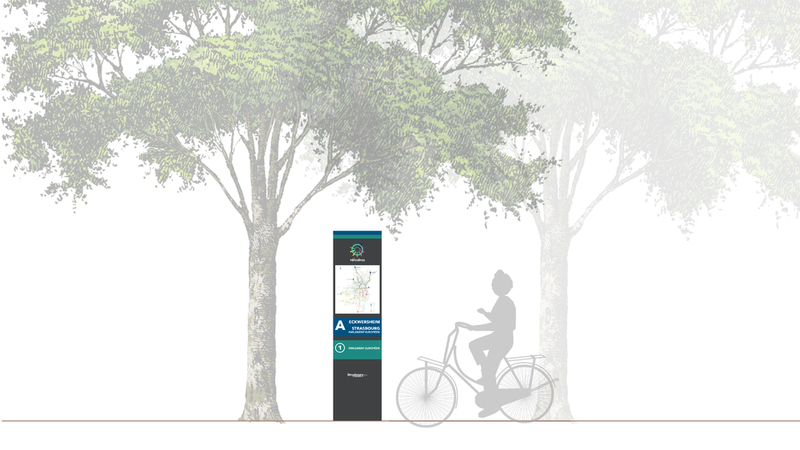 Finally, in case bicycle users need extra information on their itineraries, wayfinding totems with maps will be placed at strategic route intersections or crossings, to indicate the fastest way from A to B and the locations of key destinations and public air pumps. Of course, each totem will be customized according to the route’s colour, adding to the overall colour strategy and cohesion. We’re excited to see this project take off in Strasbourg. Wayfinding totems with maps orient users to key routes, destinations, and amenities.